What kind of orders can the judge make? For a number of reasons including job loss, relationship breakdown, interest rate rises, paying other less important debts first, many people have got behind with their mortgage and secured loan payments or are struggling in one way or another to maintain them. Maintaining payments towards your mortgage & secured loans will normally be a top priority expense as failure to do so will usually mean that your home will eventually be put at risk. A time order could be particularly useful if you have a secured loan and your creditor is threatening to repossess your home. Not all secured loans can be covered by a time order (see below). Before lenders take court / possession action for arrears they usually send out letters outlining the level of arrears / missed payments etc and requests that you contact them to make up the arrears. If you do not address the situation it is likely that you will receive a formal solicitors letter informing you that an application to court for possession will be / has been made. Lenders will not usually start possession proceedings until accounts are at least approx 3 months in arrears. Your mortgage lender should not start court / legal action against you without following certain rules as set out by Financial Conduct Authority (FCA). The rules say that your lender must treat you fairly and give you reasonable chance to make arrangements to pay off your arrears, if you are able to. They must consider any reasonable request from you to change when or how you pay. Your lender should only start court action as a last resort. As well as the FCA rules, your mortgage lender should follow certain other procedures before they start court / legal action. These are called a pre-action protocol. If you do not contact or cannot reach an agreement with your lender(s) and they have followed the correct procedures as briefly described above then they may take you to court for possession / eviction. If any lender(s) start possession proceedings then you will be sent a claim form by the court informing you of the time and date of a hearing and will also include a form called particulars of claim, this will set out your lenders case for gaining possession of your home. You should also receive a N11M defence form which should normally be filled in and returned within 14 days, however the court should still accept your defence at any time before, or even as late as the day of the actual hearing (please note if the N11M defence form is returned after the 14 day period, the court may order you to pay any costs caused by the delay). If you cannot come to an arrangement then on the day of the court hearing the District Judge will ultimately make a decision. What is a reasonable time to repay the arrears? Lenders will sometimes ask you to pay off arrears over 12 to 60 months. If this period of time is not affordable you may be able to ask for longer to pay (see below). If your home is worth more than your total mortgage, tell your lender. An important court of appeal case, Cheltenham & Gloucester v Norgan says that in this situation, a reasonable time to pay back the arrears could be the whole lifetime of the mortgage. Under this rule when the court and your mortgage lender look at how long you should be given to pay off the arrears they have to take account of how long is left to go on your mortgage. So, for example, if there are 10 years left remaining on your mortgage term you could be given 10 years to clear your arrears by making monthly payments on top of your normal monthly installment. You may need to draft a Financial Statement to take to court to show the District Judge that your offers are sensible and sustainable or get independent advice and assistance with this and court representation if necessary. It can also be very useful to take to court any other evidence to back up your case such as DWP mortgage costs / application & other benefit claims, proof of wages, benefits, tax credits, other income, recent mortgage payments, lender correspondence, evidence of health problems etc, proof that you have had advice. It is important that you should attend any court hearing allowing yourself ample time to arrive at the court. You and / or your representative will normally have the chance to consult / negotiate with your lenders solicitor / agent and may be able to come to an agreement with your lender before the actual hearing takes place. Attending the court hearing will give you the chance to state your side of the story and could give you a better chance of staying in your home. If you do not already have a solicitor or an agency adviser to represent you, there may be help available at the court via the duty solicitor / adviser desk scheme. You should contact your local court before any hearing date to establish if they operate a duty scheme if appropriate. The hearing will be held at court before a District Judge who will consider the information and evidence provided by both sides (the lender (claimant) / representative and by you (defendant) / representative) before making a decision. Irredeemably unenforceable secured loan agreement. If possession proceedings are in relation to a pre 6th April 2007 secured loan regulated by the consumer credit act, you may have a defence on the ground that it is irredeemably unenforceable. You were given bad advice when you took out the loan or mortgage. This is called "undue influence and misrepresentation". You should always seek independent advice from a housing specialist, solicitor or other independent agency if you think any of the above could apply to you. If you fail to reach an agreement with your lender and do not attend court then it is very likely the District Judge will make an order for possession in your absence. If the District Judge does make a possession order (for example 28 days) then this does not mean you have to leave the property after the 28 days have expired as your lender will still have to apply for a warrant of eviction. 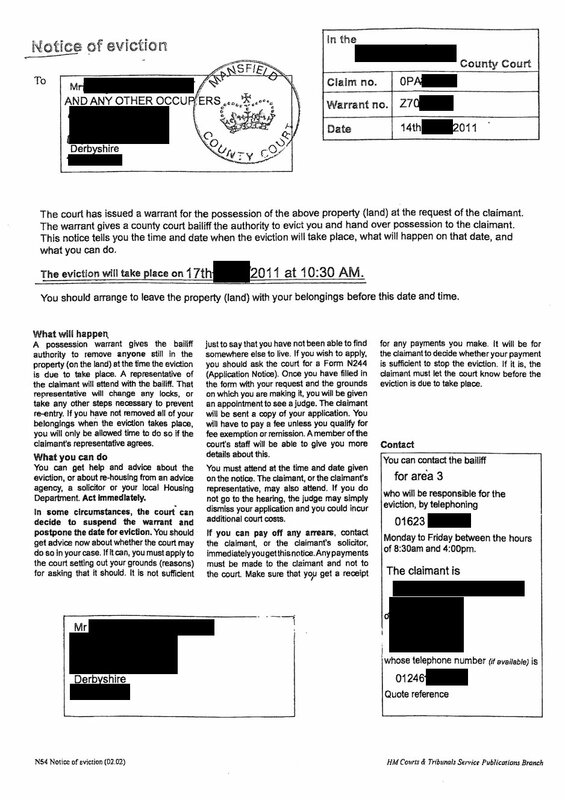 If the District Judge makes a suspended possession order on terms (example full mortgage plus a monthly amount to clear the arrears) you must maintain payments as ordered by the court, as failure to do so will very likely result in your lender asking the court to issue a warrant for eviction which can be done without another hearing. If you experience problems maintaining payments on a suspended possession order, do not ignore the situation and let arrears build up, speak to your lender and get immediate advice. A the court hearing the District Judge will consider the evidence / proposals and make a decision as to whether adjourn the hearing / suspend possession or order the eviction to take place. If the eviction is ordered to take place you could try asking the court for more time to allow you to get re-housed. If all your efforts to remain / stay in your home fail, you will be given an eviction time and date as already explained. This is really the end of the road and unfortunately on the named day the bailiffs will attend and evict you, forcing their way into your home if necessary (with a police presence if needed). It will greatly assist advisers and could save valuable time if you gather together as much information as possible before any interview. What details should I bring with me for advice with mortgage arrears? Have you contacted your lender(s) about options? How much is the house approx worth? Was the house purchased under the Local Authority right to buy scheme? What the position is regarding equity in the property negative / positive / how much? What are the normal contractual monthly payments on the mortgages / secured loans? What are the terms of the mortgage payments (example interest only)? Are the terms of the mortgage payments set to change (example end of a fixed term interest rate)? What is the remaining term of the mortgage (how many years & months left to pay)? Can a third party help you with the mortgage / secured loan payments (example family or friends)? Have you made a claim for help with mortgage interest payments via the DWP? Has anyone else got an interest in the property (beneficial / financial)? Is the house up for sale? Have you any other debts? Have you any savings / assets? Have you contacted your local authority housing department regarding homelessness & re-housing issues?